I have many different collections of plants here at Whimsey Hill House, and one of them is Hens-and-Chicks (Sempervivum). Hens-and-Chicks are a ground hugging succulent that I think look a bit like a small rose or cabbage. Sempervivum are probably one of the easiest perennials to grow, will flourish with almost no care, and besides that, you can develop quite a collection of them because they don’t take up much space. 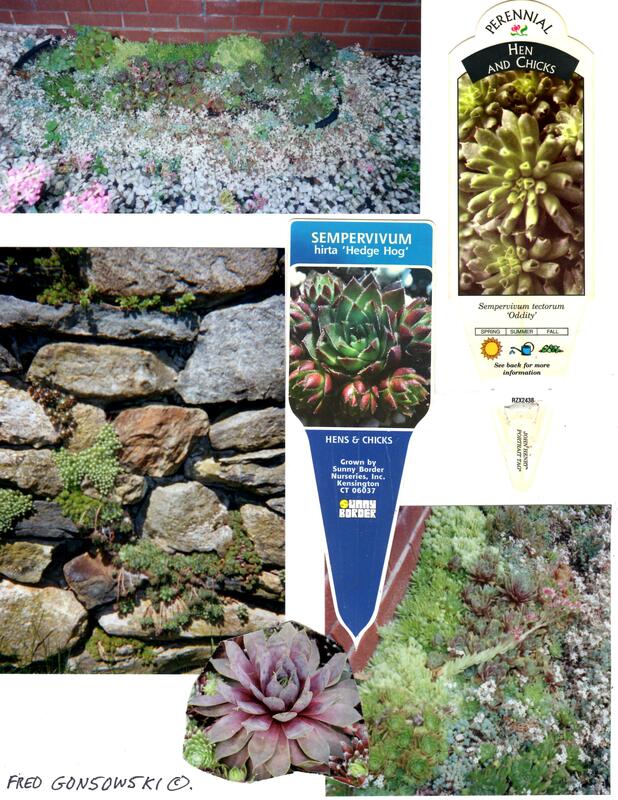 Buying Hens-and-Chicks ..Sempervivum are sold at garden centers and through mail order catalogs. When selecting you plant(s) choose one(s) that has a Big Mother (the Hen) and is surrounded by many Baby plants (the Chicks). Never buy a Sempervivum that is just one big hen. I did that once, thinking she would produce some chicks, but instead she just flowered and died. Siting your Hens-and-Chicks ..All planting tags say Sempervivum like to be placed in full sun, this is true, but because they are growing in minimal water retaining soil, I think it is best if you can find a location for them that gets some dappled sun during the hottest part of the day between 12PM and 3 or 4PM. I have mine planted so they are facing south and west, but my next door neighbor’s trees produce shade, which cuts the intense light, and heat of the sun on them during the hottest part of the day. Planting Sempervivum ..Hens-and-Chicks are one of those kinds of plants that will do just fine in poor to average soil, as long as it quickly drains after getting wet. To decrease the soil’s water retention ability, mix in some sand or small crushed stones so water quickly falls away from the plant’s roots. 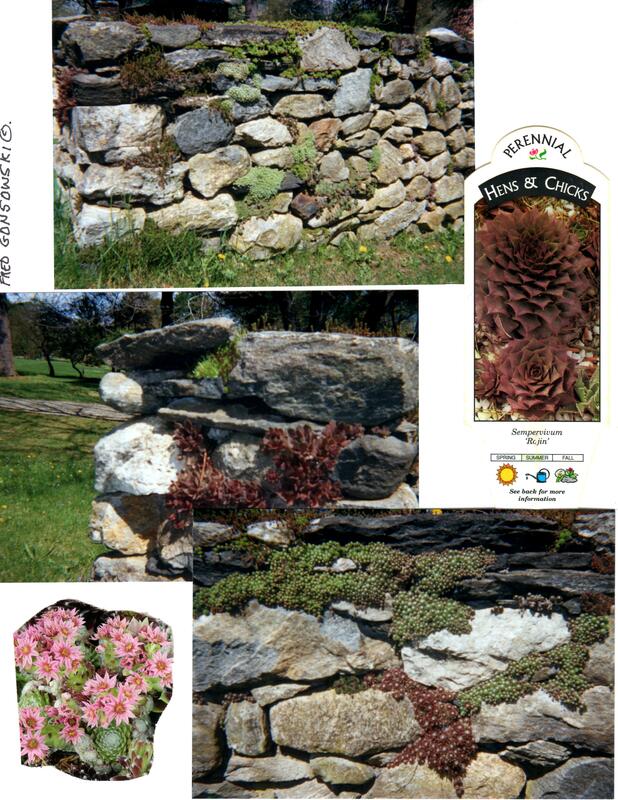 Hens-and-Chicks can be planted in the ground, in containers, or even in stacked stone walls and among rocks, as long as you have some planting pockets for them to be inserted. If you are thinking about planting them in stone walls, first push some soil in between the stones so they have something to hook to, then insert your plant. Watering Sempervivum ..After planting your mother hen and chicks give them a drink to initially moisten the soil where they will be living. After that, only water when the soil they are in looks dry. With a watering can or hose quickly spray water on them, but not too much; they will take in too much water and die. I once bought an odd-looking hen-and-chick at a garden center in north-west Connecticut. I got it home, planted it, gave it a good drink and a week later it was dead. I over watered it. When it comes to Sempervivum Less water is the Best. Separating Chicks from the Hen can be done anytime as long as the chick has a bit of the original root that attached it to the mother. That life line attached to the chick will help to anchor it in the soil and new roots will grow out from it. When Hens Flower ..The life cycle of the Sempervivum is very basic. It is all about the hen reaching a certain size, producing a number of chicks to keep the genus going, flowering, casting seeds and dying. You can tell that the life cycle of a hen is about to end when it starts to produce a flower. The flower stalk grows right up out of the center of the hen, and reaches 6 to 8 inches high, ending in a bunch of pink star-like flowers. The flowers last a few days to a week, the stem collapses, dries up and the hen dies. At that point she should be detached from the chicks and thrown away. So there you have it, the basics on growing Hens-and-Chicks. There are many varieties, colors, and even shapes to choose from. If you fall in love with them, as I did, you will find yourself looking through every garden center you come across, to see if they have ones that you don’t already have. Enjoy the Hunt! This entry was posted in Roses, Peonies, Tulips, etc, The Spring Garden, The Summer Garden. Bookmark the permalink.